The charcoal black SoundSport In-Ear Headphones for Apple Devices from Bose have a full, balanced sound and feature StayHear tips that conform to your ear's shape to stay in place all day. The sport-inspired sweat-resistant headphones can be used to stay secure during vigorous workouts, exercise, and more. In addition, you also get a sport-inspired case matched to the color of your headphones. It provides a place to keep your keys and cash during exercise, and an attached carabiner allows the case to tag along wherever your workout takes you. Box Dimensions (LxWxH) 8.5 x 4.9 x 1.7"
SoundSport In-Ear Headphones-Apple Devices (Charcoal Black) is rated 3.8 out of 5 by 321. Rated 5 out of 5 by Casey from Great product I just purchased this earphone and I'm really suprised that this earphone satisfied every aspect of my life. I'm commuting outside on the motorcycle and study at library and this earphone fit my ear like a gloves even it's inside the helmet, and really comfy with this pair too.I tried a lot of music genre and I realized the sound of this earphone is really nice from the low to high peak. The bass is not like punch directly to my ear drums, but I feel like it spread out inside my ear and dont get me tired after long period of using it. This one is not totally noise isolation so, IMO, it's safer when I use it for daily commuting. Rated 5 out of 5 by dalden from Excellent ear buds but...... Where are the models with a lightning jack? And why haven't the wires been made tangle free? All we need are flat wires, as so many others have done? And the remote switch can be improved with more pronounced buttons for volume and forwarding music, play next/etc? Also, These are the only models of all the earbuds that have the ability to let outside sounds in, which is vital for bicycle riding, and other activities where you need to be able to hear around you. The focus seems to be going towards isolation noise barriers, which is fine for over the ear models, but not ear buds. Bose can do better, and they should. They have a reputation to protect. Rated 5 out of 5 by jluck from Amazing durability and comfort I bought a pair of soundsports new about 5 years ago and LOVED them. The comfort is unbeatable and the sound is perfect (as you probably know, if you're here, since it's Bose). They're the only headphones I can fall asleep in since they have that oval-shaped tip that your ear can actually forget about. Love the different sizes of buds that come with each pair. When the rubber around my cord started to break after 4+ years of heavy use (in all sorts of climates, etc.) I immediately bought a new pair. I'll probably never buy anything else. I only wish they had more colors to choose from. Rated 1 out of 5 by JZ3 from Worked great for 6 months The fit and sound of these were both a big upgrade from the earbuds that come with the iPod Shuffle. I run and workout frequently and was initially very excited with the increased volume and secure fit these offered so I got a second pair as a backup. Both pairs however now have significantly reduced volume overall and one side is barely audible on both sets. The volume controls on one set stopped working completely. The first started failing within 6 months and the second within 3 months at most. So disappointed as this is what happened to the cheaper brands I've had in the past. I expected better given the company, price and reviews. Rated 1 out of 5 by Matt93 from Absolutely Unacceptable I have used Bose headphones for more than a decade and they were the best headphones that money could buy in my opinion. The newest generation of headphones is completely unacceptable. They are a big step down from the previous generation. They are not as loud and lack bass reception. I think that they are making all their headphones sound the same so as to increase their wireless headphone sales. The SoundSport, although using a different name now than previously, has been their flagship in-ear headphone and have downgraded it just to increase revenue for their wireless brands. For me this is absolutely unacceptable. I am not ready to give up sound quality for portability. Rated 1 out of 5 by Shawn from Poor jack design. I have bought 7 pairs of these, each time to correct for a damaged jack/plug. Sound is great and functionality is fine. But using it with an iPhone and living daily life it is far too easy to damage the jack on them. The IE2 design used an angled jack which has been abandoned on the SoundSport line. I had many pairs of IE2 and never had similar issues. I cant hold Bose responsible when I bang it and break the jack. But the design choices here leave it too susceptible to damage in my opinion. Cant keep spending this much on a headset to have it only last till the next time I bump the connectors. Back to <yech> apple headphones I guess. Rated 5 out of 5 by JustJoe from Great Quality Sound! I've been a fan of these In-ear headphones since 2010 and I've owned about 4 pairs. The vocals are balanced greatly allowing you to hear nuanced sound in the background of the music. The bass is sufficient and enjoyable. I love the Stay-Hear Tips w/ wings which allow a proper and secure fit within the ear. (I prefer the large tips for a more secure fit.) I have stayed with Bose all these years because of the all around sound quality. The tips rest in the bowl of the ear and do not have to be shoved in the ear canal like every other in-ear headphones, which i despise due to the uncomfortable fit with long term wear. Awesome In-Ears worth the purchase. Please keep producing these wired In-Ear Bose! Rated 5 out of 5 by BrChap from Fantastic! Just as described and advertised. These earbuds are just as advertised, which today, is rare. They are a fantastic ear pod replacement. I have never had them fall out of my ears, where as the ear pods never stayed in my ear while running. I have never had to remove them due to them being uncomfortable. 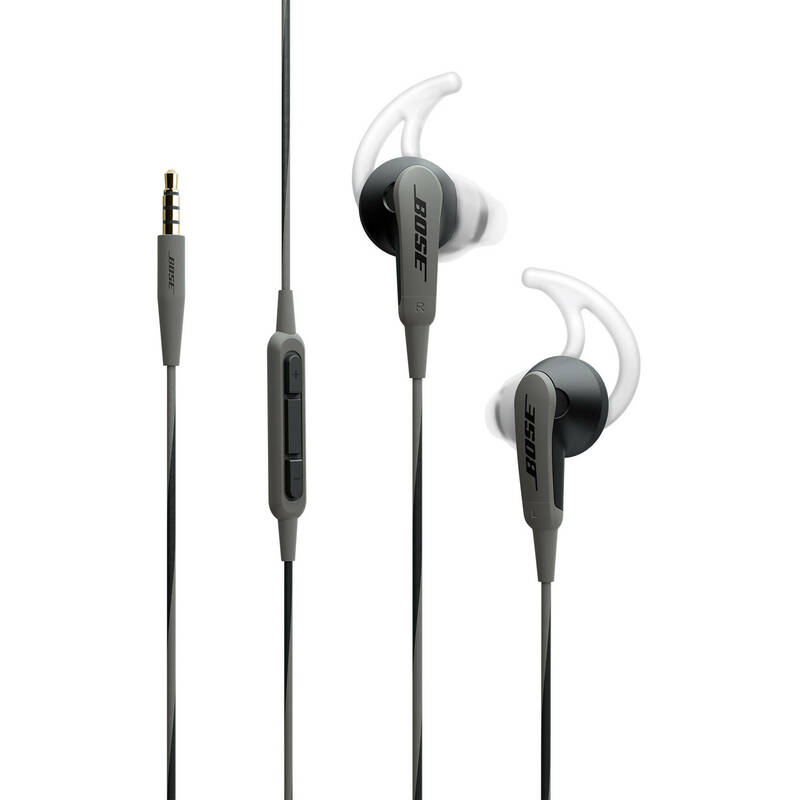 The sounds blows away earpods, they aren't even in the same league as these Bose ear buds. The buttons work like they were made by Apple themselves. Customer support? I don't know, I haven't needed them. How is the durability of these headphones? I've had a few people tell me their earbuds began to fall apart or spot working within 6 months. Durability is not an issue with my pair. I commute and travel with these and have dropped them at least a dozen times. I have owned these since last November and love them. My recommendation is to purchase the third party noise cancelling tips for these. Is Bose earbuds much better then beats earbuds they both cost the same? I own both...sound wise they are comparable.However, Bose wins (hands down) for comfort. hi, can I use this earphones in a android device? Yes, you can use the Bose SoundSport In-Ear headphones in an android device. I have used them with my iPad and iPod as well as my Blackberry (which is android), so they do work with both. This cannot be used with an Android phone?